This week, the children of Reception have loved being back after half term! They have all enjoyed planting their very own sunflower, which we are all excited to see grow over the next few weeks! As we have been lucky enough to have beautiful weather this week, the children soaked up the rays. Here are some snapshots! This week, we have learnt all about addition, linked with our money theme and the children have loved purchasing all things pirate! We have been working very hard this week in Reception. We have been enjoying writing our sounds in various ways, from big paper outdoors, to under the table and on huge sensory trays! As well as our writing, we have embraced The Greatest Showman within our classroom, and the children have loved putting on shows for the teachers and their friends! Here is what it looked like Reception style! Bedtime Story Event - 16th January 2019! Christmas Cheer and our first class visit to Highfield's Care Centre! Reception Class spread their Christmas cheer at our class visit to Highfield's Care Centre, as we sang our Nativity songs to the residents there. The children sang beautifully and danced along spreading their Christmas spirit! After the performance, we shared some of our favourite festive stories with the residents. Here are some of our Christmas pictures, both in and out of school! Children in Need fun and Scooter training practise! Every morning, Reception Class participate in Go Noodle, which helps develop our gross motor skills and allows us to get our brains into gear on a morning! 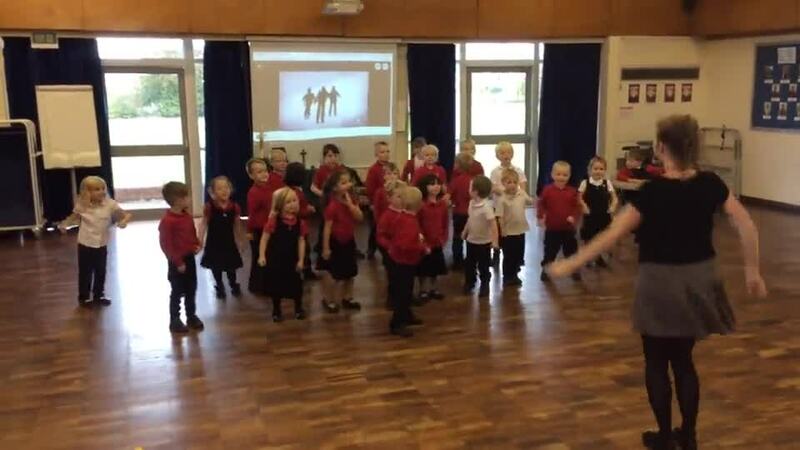 We have worked hard at practicing this dance routine 'Jump'. We hope you enjoy it as much as we did! We cannot quite believe that reception class have only been with us for five weeks. They are working so fantastically and have kept us on our toes with all of the different interests we have pursued over recent weeks. Some of the things we have covered are: We're Going on a Bear Hunt, dinosaurs, fairies, Autumn and mini-beasts! We are looking forward to looking at 'all things spooky' in the run up to half term. This week we have also begun our phonics lessons and pupils have had lots of fun searching the classroom for items that begin with the sounds we have been learning. Wow! We are so completely impressed by our new reception class. They have settled so well and we are having the best time getting to know all of their individual personalities. Thank you parents for such fantastic support over the last week. We have included a few photographs of our class in action so you can have a sneak peek into life in reception class. We are so very excited to see all of our lovely children and parents soon! Here is a picture of Mrs Fox's daughter on her first day of reception - you may want to do something similar. "going on the big playground"
Reception Class had a fabulous trip to Lotherton Hall. They really enjoyed exploring the gardens and the wildlife area. We all sat down and had an ice cream in the sunshine. The children in Reception class really enjoyed their workshop with Karim the visitor. He told us the story of the Hyena and the Rabbit. The children really enjoyed finding out all about Africa. Karim played different instruments for us and we moved around as different animals. The visit really inspired the children and we have followed this up in class through orally retelling the story, drawing story maps and writing our own versions of the story. This week we had a special delivery in Reception class: some frogspawn. We have been watching it closely and already it has started to hatch and we have our own tadpoles. The children are very excited to watch as the tadpoles grow and change. We are trying to understand that growing and changing can take a long time and that they won't turn into frogs over night. The children have their own tadpole diary so that we can record our observations as they grow and change. Following on from the children's interests in money we decided to build a shop in the outdoor area. The children really enjoyed being a part of making this enhancement and some fabulous learning has taken place since. Today the children have been learning all about Science and carrying out different investigations based around our 5 senses. First of all we wanted to find out who had the best hearing- adults or children? So we did a hearing test and we found that children have the best hearing. We also investigated a range of objects to see which different sounds they made. We also investigated our sense of smell. the children had some mystery smell pots that they had to try and use their sense of smell to recognise what was inside. They really enjoyed trying to work them out and recorded their ideas. We carried out lots of different investigations and some of the children thought of their own lines of enquiry. Reception Class had a visit from the police. The children had all prepared a number of questions that they wanted answering. We interviewed the officer and found out lots of information. The children looked at all of the equipment and the uniform, she even let us try on the handcuffs! We showed the officer our police station that we have made in class and she gave us some ideas of things that we could add. The children all listened really well and spoke confidently to the officer. Last half term a mysterious object crash landed onto the school field and the children were so excited that they decided to learn all about Space. We turned our role-play area into a space ship and read lots of stories related to space and aliens. It was exciting to explore many new and interesting things such as Jelly aliens and space slime. We enjoyed a visit from the Yorkshire Planetarium. We were able to imagine going into space and seeing all of the planets and stars first hand.